Big Red Car here on a sunny, chilly Thursday in Austin By God Texas wishing you a Happy New Year and talking plumbers. On the tail end of renovating several bathrooms (to the studs), a kitchen, a powder room, and a utility room, I am conversant with plumbers. So, we need some rules, don’t we? Some Big Red Rules on PLUMBERS. 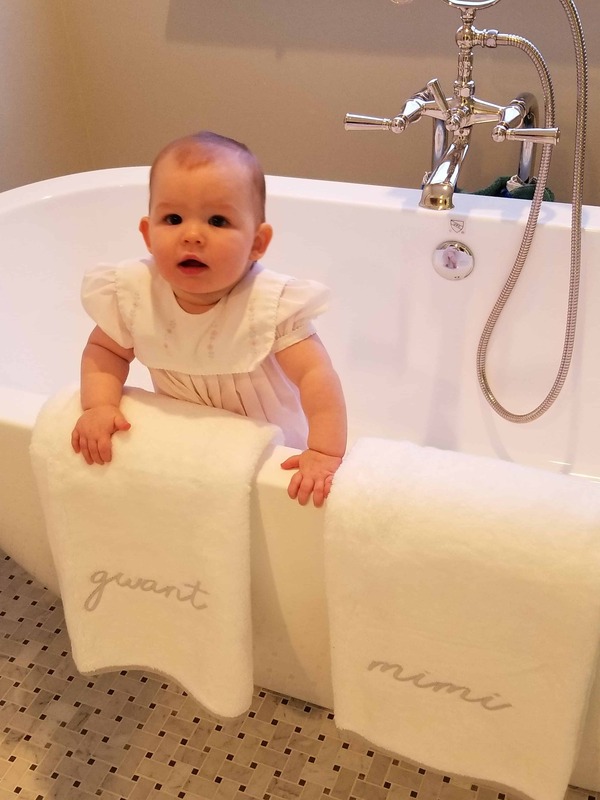 A baby named Tempe, a newly renovated bathroom, and a direct-to-consumer startup towel company called “Weezie Towels” co-founded by this girl’s mother. No, she is not a plumber. Never, ever trust a plumber under the age of 55. Hire father-son plumbing teams. They are the best. Being a Master Plumber means something. Ask, bow, and thank your lucky stars. Back out of the room while maintaining eye contact. Look at the plumbers truck before you hire him. If it is large, he will have a lot of parts. Lots of plumbers are driving big Mercedes vans these days. If it is neat, the work will also be neat. Hire plumbers who look strong. Have you ever tried to remove a tub spout that’s been in place for thirty years? Respect your plumber. He is strong, smart, an artist, a scientist, a perfectionist (you hope), an engineer, knows products, and has a cell phone which he may answer sometimes. Yes, of course, regardless of how many cutoffs you install you will have to turn the water off to make THAT repair. When you turn it back on, go run every faucet, flush every toilet, run every shower. Pressure test everything while the plumber is still there. That new disposal will be replacing one that is smaller and required less power. Trust me on this one. Keep all your receipts. Yes, you have to pay the plumber if you send him to Home Depot to pick up a toilet. Have it waiting on him. Be available to answer questions, do not hover over a plumber while he is working. He will charge you extra to listen to your stories. Plumbers know how much all that fancy hardware costs, so if you are installing Newport Brass, he knows that it cost more than his first car. Yes, it will be reflected in his bill. If a kid had to choose between med school and plumbing, there is no bad choice. There is the cost of the plumber who is actually at your house and there is the cost of the plumber who never shows up. They are radically different costs. In all disputes amongst plumbers, cabinet makers, and countertop men — side with the plumber. You can find other cabinet makers and countertop men. Yes, the countertop guy installs the sink before the plumber plumbs it, but you have to have the plumbing hardware before the countertop guy cuts the holes. You cannot move the holes. Gravity and pressurized water are destructive forces like fire. Treat them with respect. Yes, you should have a fire extinguisher if a plumber is going to be doing any soldering. Own one. Yes, PEX is the real deal; and, yes, it took a couple of centuries for somebody to invent it. If your plumber doesn’t like PEX, get another plumber. Even if you can’t get to all the hot water piping in a remodel, insulate whatever you can get to. There is absolutely nothing wrong with setting your daughter up with a boy whose father is a master plumber. But, hey, what the Hell do I really know anyway? I’m just a Big Red Car. Want the name of my plumber? Fat chance! This entry was posted in Uncategorized and tagged plumbers. Bookmark the permalink.